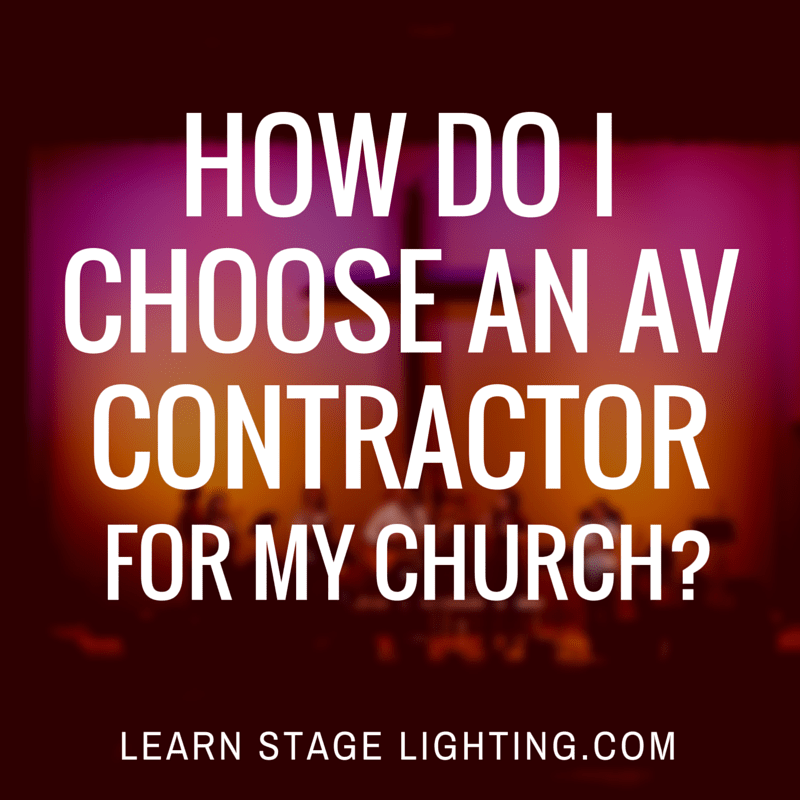 / How Do I Choose a Contractor for My Church’s AVL System? Do you want to save $50,000 today? The single biggest decision you’re going to make for your church’s audio, video and lighting system is going to be the decision to replace your current system with something new. Depending on the size of your building and the complexity required, this is going to cost you anywhere from thousands of dollars on the low end to millions of dollars on the high end. It would be an understatement to say that choosing wisely when it comes to a AV contractor is really important! Getting this single decision correct will mean a great AVL system that meets your needs, is well thought out and comes in on budget. Unfortunately, we all probably know of someone who made a bad choice in an AV contractor and got burned or didn’t get the system they needed. So how do you choose wisely? One of the great advantages to being a church, is that you probably know of another local church who has recently put in a AVL system. And if you don’t, ask around and you’ll find someone! Before shopping for a AVL contractor, you need to call around to ANYONE you know and ask about their experience with getting a new system installed. You’ll quickly find out who’s happy with the AVL contractor they hired and who’s not! Arrange visits to these other churches and take your AVL leaders with you to see what other finished systems look like, and begin to create a vision of what your system will be. Step 2: Find Your Identity First, and Make Sure They’re Listening! Like step 1, this second step is really, really important! Long before you get any bids or talk with any contractors, you need to get a good idea of what you want your end product to look like. Think about your current system and what needs to be improved. Think about the identity of your congregation and what styles of corporate worship and special events currently go on, and what you want to see in the future. When you do begin to talk to contractors/consultants, you can weed out the bad ones by seeing who listens to your needs, and which ones send you a “form quote”, that doesn’t match your congregation at all. Be sure and talk over each quote with the contractor when things don’t match up and see why they suggested such items. Contractors may suggest gear or placement that you didn’t think of which would be perfect for your needs! Like any big project, it’s important to get multiple bids and evaluate them to see which will work best for you. As you look over your bids, some will likely be abnormally high or low. But this isn’t the place to go cheap – you will likely regret it, unless the contractor/consultant in question comes highly recommended. Like in many projects, choosing the lowest bidder is not likely to end well. Once you choose a contractor and work begins, it’s important to poke your head in every once in awhile and see how things are going. Do show interest and ask specific questions if you are unsure about anything. Remember that 90% of the work is going to look like very little progress is happening, and 10% of the work will look like major progress! Don’t spend all day babysitting the contractor! Give them some space to do their job bringing you an awesome AVL system, and you’ll be happy for years to come! New to lighting and not sure where to begin? Grab my guide to begin with lighting at your church today!